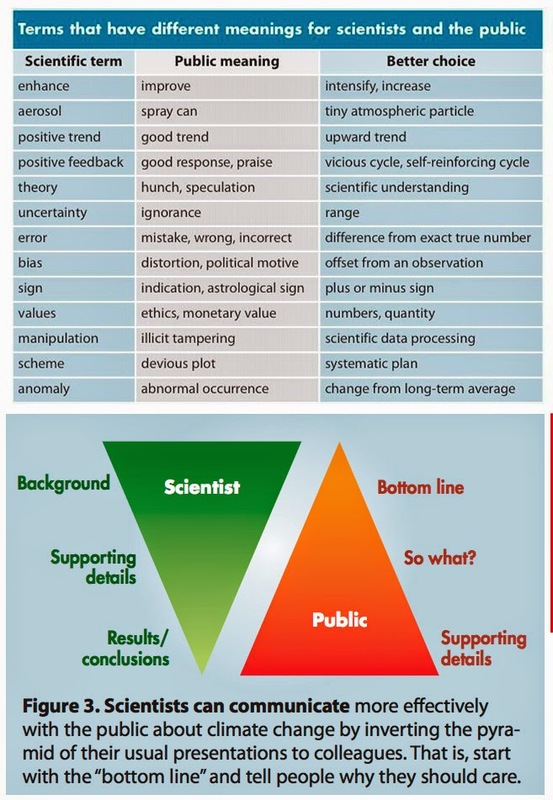 The table and diagram on the left are part of a 2011 article (h/t Kelly Kuhn-Wallace) on how scientists can effectively convey the truth about climate change to the public. It may be useful for specialists and researchers in any field. The pyramid-like diagrams summarize another challenge: When writing for their peers, scientists focus on the background and supporting details, and only after those have been settled they move on to the conclusions. When they address the public, scientists may need to invert that pyramid. This illustration reminded me of Randy Olson's Don't Be Such a Scientist and of Chip Heath's Made to Stick. Just to be clear, when I wrote "public" above I was also referring to journalists and designers. Cases like Yahoo's Virginia Heffernan's, who upset so many people (including me) a while ago, are still too common in newsrooms, I believe. Therefore, dear colleagues, besides taking a look at the article these graphics belong to, I'd also recommend that you read and memorize Nature magazine's fantastic 'Twenty tips for interpreting scientific claims'. Really, save it in your browser's favorites. It's worth your attention. UPDATE: The good friends at UM's Abess Center have just sent me the link to The Psychology of Climate Change Communication, which looks great. The table on page 27 of its PDF version is very similar to the one at the beginning of this post. Today’s intellectual fashions tend instead toward the empirical, the data-driven, and the breezily counterintuitive. (…) But experimental science, it turns out, is no less susceptible to a good, thorough hoaxing than postmodern blather was.